Tenmyouya has taught himself the technique of Japanese traditional painting styles: Kano-school, Rinpa-school, and Ukiyo-e. He is an artist known for inheriting these styles with a contemporary medium acrylic paint depicting public manners and social caricature with lines and surfaces (which may be mistaken as digital outputs) opening up his own painting expression “Neo-Japanese painting”, which holds both delicacy and boldness. The element of anti-authority continued from a sprit of an unique Japanese outlaw cultures from Muromachi period “Basara(*i)”, Edo period “Kabukimono(*ii)” to Heisei era (1989-) as its core, Tenmyouya energetically creates, exhibits and fights with his brush that makes him appropriate to announce himself as satirizing schools of traditional Japanese painting “Buto-ha(*iii)”. These “Neo-Japanese” works are painted by convinced criminal of -Neo-Japanese painter- Tenmyouya, who is fully versant of the very essence of “art is distraction and creation”, giving influence and spectacular sensation not only to art fans but also to people in various genre, expanding his activities to over sea and outside of exhibitions. The theme of this exhibition “Bunshin” means other self, separated self or alter ego in Japanese. Its central motif are autoscopy, internal other being, twins, “other existence” or “Bunshin.” Also, it is referred to tattoo, which is another meaning of “Bunshin” (written with different Kanji.) in Japanese. 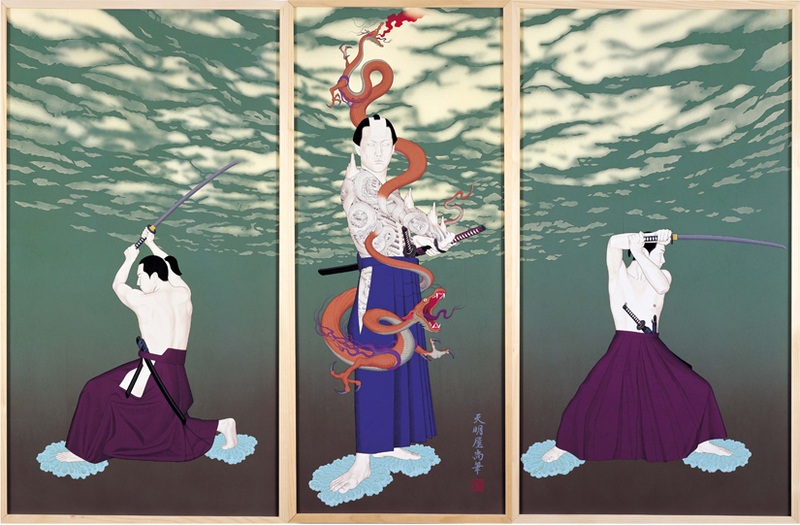 In this exhibition, Tenmyouya has interpreted “Bunshin” to two prominent types: synchronized and mirror opposites, than embodying it to two-dimensional work. “Bunshin” has been covered in many literatures: Edgar Allan Poe (1809-1849) and Fyodor Mikhaylovich Dostoyevsky (1821-1881) in the west, and Ogai Mori (1862-1922), Kyouka Izumi (1873-1939), Ryunosuke Akutagawa (1892-1927), Haruki Murakami (1949-) and Keigo Higashino (1958-) in Japan. It is a theme, which attracted all ages and cultures of cultural figures and artists. What allure so many artists to speak of “bunshin”? How is Tenmyouya going to arrange and execute this conjuring theme to a contemporary Japan? He shall daringly challenge this mysterious and spiritual theme. The exhibition space will be filled with all new works, bringing “BUNSHIN” that exquisitely captures the moment of disembodiment of a dragon tattoo escaping from man’s body and turning into “bunshin” soaring to the sky as its central piece.